“Picture books by Lita Judge” was the theme chosen by my friend for one of our book club meetings. This was a great idea as Judge is an accomplished picture book author and illustrator. 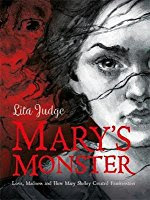 As I perused my local library catalogue, I stumbled upon another book for older children (aged 13-17) that immediately caught my eye: Mary’s Monster, Love Madness, and How Mary Shelley Created Frankenstein. Mary Shelley was a runaway pregnant teenager and rejected by society, the Introduction informed me. My interest was immediately piqued. And rightly so. I had only to read the initial few pages to know this was something special. As the first modern science fiction book, birthing the ‘mad scientist’ archetype and also the legendary Creature that still haunts us 200 years later, Frankenstein was a novel that defied convention. Judge’s book is also deliberately hard to categorise. It is part biography, written in first person free verse, and also veers into fantasy as the narrative delves into Mary Shelley’s inner world. Judge has made over three hundred full-bleed black-and-white watercolour illustrations which create, in her words, ‘a dance between words and art’. The overall effect is an all-consuming immersion into the life of Mary Shelley, her work, her imaginings. The beginnings of Frankenstein are often ascribed to a famous ghost-story challenge set by Lord Byron, the Romantic poet, to Shelley and her circle one rainy evening. However the seeds of this story lie much deeper. Judge uses concise, evocative poems to communicate the threads leading to the creation of Mary's story, embedded in well-researched historical and societal context. Mary was born into a world of extremes on the night Herschel’s Comet lit up the London sky. Her mother, Mary Wollstonecraft, was an advocate of women's rights, later considered the founder of the feminist movement. She died ten days after giving birth. Her father, an anarchist who fought for the poor and the oppressed, encouraged Mary to be independent and imaginative. Yet her practical application of these teachings was too much for both her father and society. Mary fell in love with a married man, Percy Byshhe Shelley, and ran away with him together with her sister. Soon she fell pregnant and was publicly shunned. Modern readers might be interested in considering some of these themes in light of the recent #MeToo campaign. Judge does not shy away from the harsh life Mary faced, including the loss of her baby and her lover sharing her sister, Claire. Although scandalous, Mary’s social circle gave her access to cutting edge scientific thinking of the time. For instance galvanism, a process by which a corpse could be ‘animated’ using electric shocks, was a popular topic of conversation. How far could these scientists go? How far should they go? As dark events circle ever closer around Mary, she takes refuge in the story that is growing within her. The illustrations show that the Creature is often near her now. Significantly, Mary’s Monster is divided into nine parts, and Mary took nine months to write and give birth to the first full draft of her own creation: Frankenstein. Tellingly, it is her Creature — Frankenstein’s monster — who opens and closes her story in the Prologue and Epilogue. For those interested in delving deeper, there is a useful Teacher's Guide and also a short video about The Making of Mary's Monster. The back matter is also rich with detail, including thumbnail explanations about what happened to the rest of the characters.